Operational visibility and risk management are key considerations for any business with multiple operational units. The corporate financial controller needs an accurate and timely rollup of GL accounts for financial consolidation. Intercompany Solution provides in-depth insight in to consolidated financial data across the organization without intensive manual reconciliation or duplicate data entry. 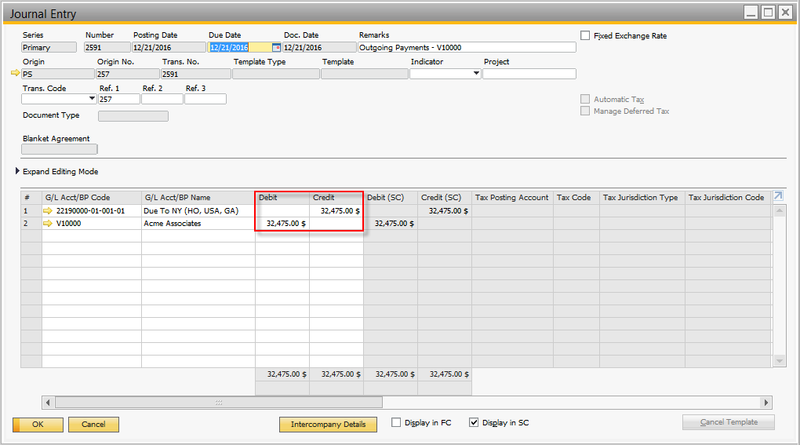 The Intercompany consolidation feature broadly makes use of the base SAP Business One functionality to present the consolidated financial statements. User need to set up additional companies in SAP Business One, one per level of consolidation. The new “consolidation” company is used only for financial consolidation reporting. When to choose consolidation source as Local Currency or System Currency in Intercompany Landscape. 1. When to choose consolidation source as local currency or system currency in Intercompany Landscape. The consolidation source field in the landscape indicates whether the financial data for consolidation is retrieved from the branch company in the company’s local currency or in its system currency. If you choose local currency in the company details for a branch company, the system picks the value from the debit (LC) and credit (LC) of journal entry from the branch company and defaults the value in consolidation company debit (LC) and credit (LC) fields of journal entry. If Branch Company and Consolidation Company have different local currencies, the application applies the exchange rates based on translation method applicable to G/L accounts in the branch company. If you choose System Currency in the company details for a branch company, the system picks the value from the debit (SC) and credit (SC) of journal entry from the branch company and defaults the value in consolidation company debit (LC) and credit (LC) fields of journal entry. In this case, system assumes that the system currency of Branch Company is same as the local currency of Consolidation Company. 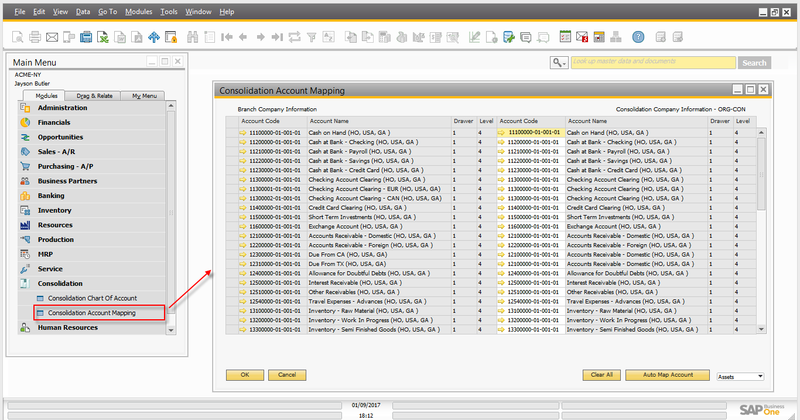 Depending on reporting requirement, user can set the consolidation source in the landscape for the branch Company. The structure of the hierarchy depends on the business scenario. 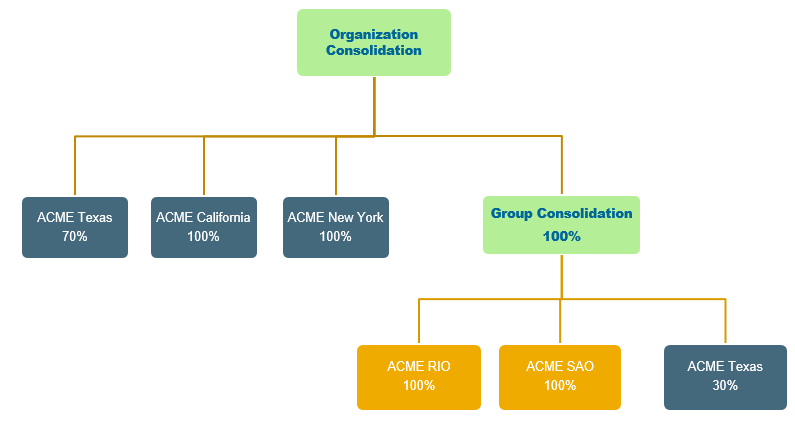 In the example shown above, you can see that ACME RIO (100%), ACME SAO (100%) and ACME Texas (30%) is consolidating in to the Group Consolidation company. ACME Texas (70%), ACME California (100%), ACME New York (100%) and Group Consolidation (100%) is further consolidating in to organization consolidation Company. From the above example, let’s discuss how to setup ACME California and ACME Texas branch companies for multilevel consolidation. First, user needs to set up two additional companies in SAP Business One – Group Consolidation and Organization Consolidation, one for every level of consolidation and define the consolidation percentage and consolidation source against the company to which Branch Company is consolidating. ACME California company is consolidating in to Organization consolidation company. To achieve this define consolidation percentage as 100 against the ORG-CON (Organization Consolidation) Consolidation company in landscape. Refer image below. ACME Texas company is consolidating in to both consolidation companies i.e. 30 % consolidation in Group consolidation and 70% in to Organization consolidation. To achieve this, define consolidation percentage as 70 against the ORG-CON (Organization Consolidation) Consolidation company and 30 against the GROUP-CON (Group Consolidation) Consolidation company in landscape. Refer image below. 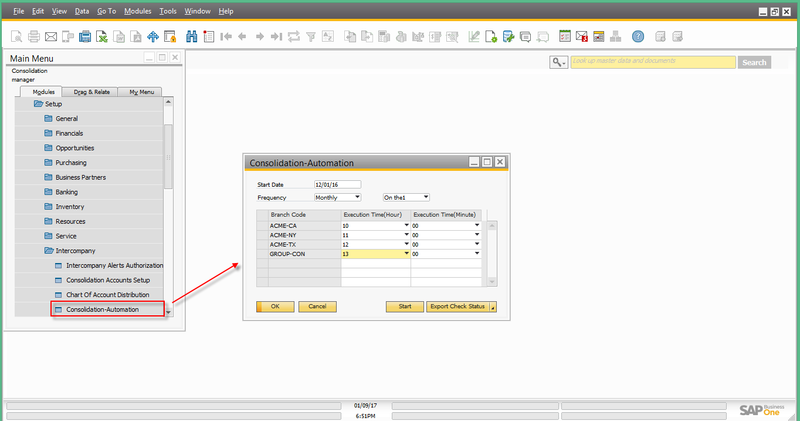 At any given time, you can check the consolidation hierarchy setup in the system by clicking the consolidation hierarchy button available in the intercompany landscape. If the local currency of the branch company is different than the local currency of the consolidation company, the system uses translation methods for exchange rates while translating the account balances from branch to Consolidation Company. 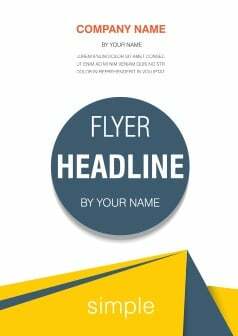 Historical Rate – The system will use the exchange rate defined for the date of the journal entry. Closing Rate – The exchange rate defined for the closing date of the consolidation period. For example, if consolidating between Jan 1st and Jan 31st, the closing rate will be the exchange rate for Jan 31st. Average Rate – A user-defined exchange rate is set in the Average Rates window. Exchange rates for translation are determined from the consolidation company. 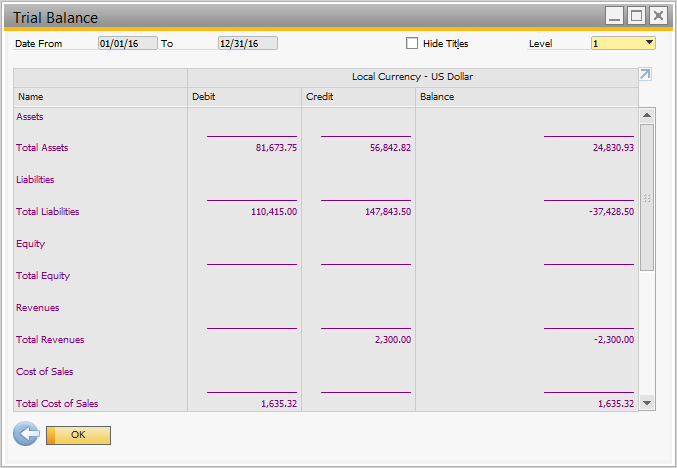 Historical and closing rates are determined from the Exchange Rates and Indexes window of SAP Business One. To define Average Rates, press Define Average Rates button on exchange rates and indexes window and define average rates there. You prepare the consolidation chart of accounts for generating financial reports, either to meet the requirements of statutory authorities or to accommodate corporate-internal reporting requirements. Once the consolidation chart of accounts is ready, you distribute it to the branch companies. 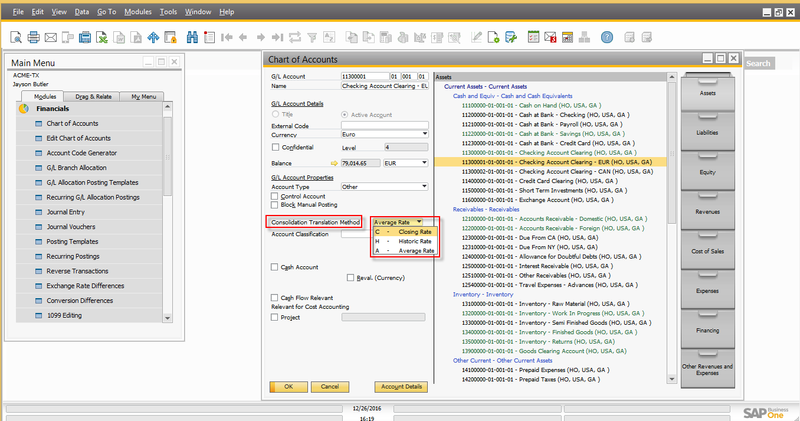 To distribute the chart of account in the consolidation company, choose Administration -> Setup ->Intercompany -> Chart of Account Distribution. After you have distributed the consolidated chart of accounts to the branch companies, you need to go into each branch company to specify the mapping of the branch accounts to the consolidation accounts. For each active G/L account in each branch company, you must specify an active G/L account in the consolidation chart of accounts to which the balance will be transferred on consolidation. The account mapping is performed using the Consolidation Account Mapping window in the Consolidation module in each branch company.Please note this step must be completed in all companies that will consolidate into the consolidation Company. If the chart of accounts structure in a branch company is identical to the chart of accounts in the consolidation company, choose the Auto Map Account option to automatically map the G/L accounts to the consolidation chart of accounts. After consolidation account mapping you will be able to export financial data from the branch companies and import it into the consolidation company. 5. When are exchange rate gain or loss accounts triggered during the consolidation process. Intercompany solution uses exchange rates gains and losses accounts in the system when consolidation source is set to local currency in the landscape for the branch company and the local currency of branch company is different than the local currency of consolidation company. You can define the exchange rate gains and loss accounts in consolidation account setup window (Administration -> Setup -> Intercompany -> Consolidation Accounts Setup) in the consolidation company. While doing Journal Entry posting in consolidation company, when sum total of debit side is greater than sum total of credit side for the journal entry, then system post this value in to the exchange rate gains account as credit. While doing Journal Entry posting in consolidation company, when sum total of credit side is greater than sum total of debit side for the journal entry, then system post this value in to the exchange rate loss account as debit. Intercompany solution supports manual and automatic financial consolidation process. Manual Consolidation: Manual Consolidation enables user to perform consolidation manually on demand. To run the Manual Consolidation in the consolidation company, choose Consolidation-> Manual Consolidation. In the consolidation company, user can run the document journal report to find the intercompany transactions that need to be eliminated in Consolidation Company. 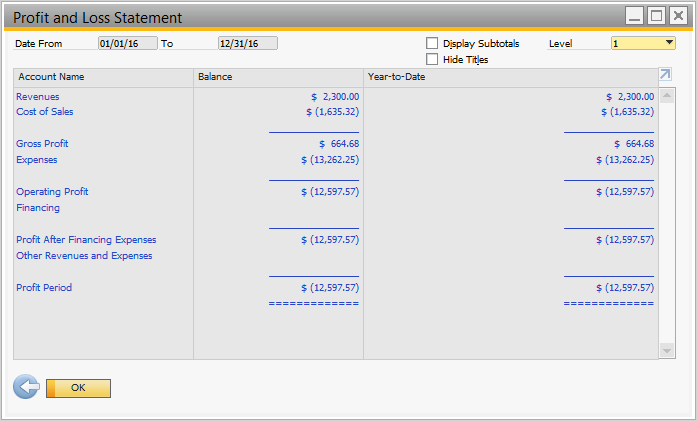 In the SAP Business One Main Menu, choose Financials –>Financial Reports –>Accounting –>Document Journal. Choose select All and choose Expanded Button. 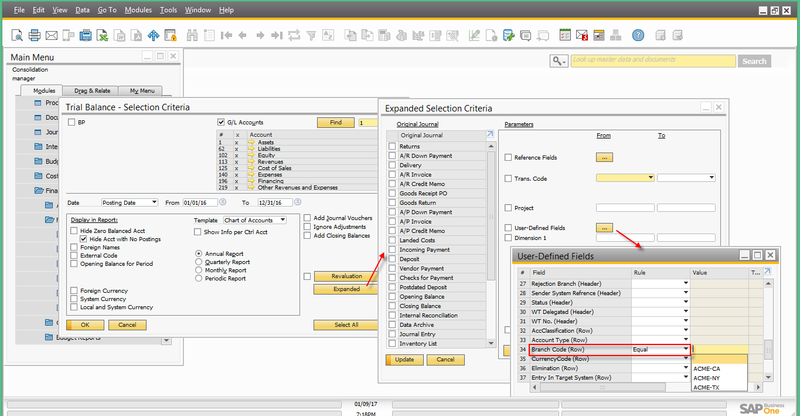 In the expanded selection criteria window, choose User-Defined Fields check box and choose the button next to User-Defined Fields. In User-Defined Fields window, go to Elimination (Row), choose Rule ‘Equal’ and select value ‘Y’ and Choose OK. 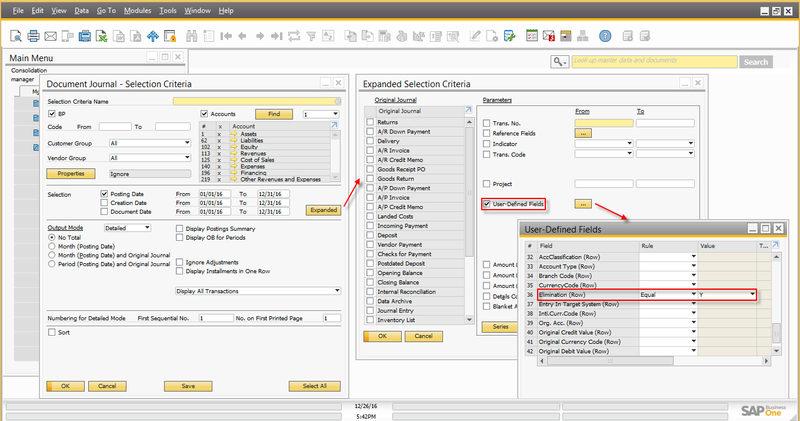 Choose update in the expanded selection criteria window and Choose Ok in Document Journal – Selection Criteria window. 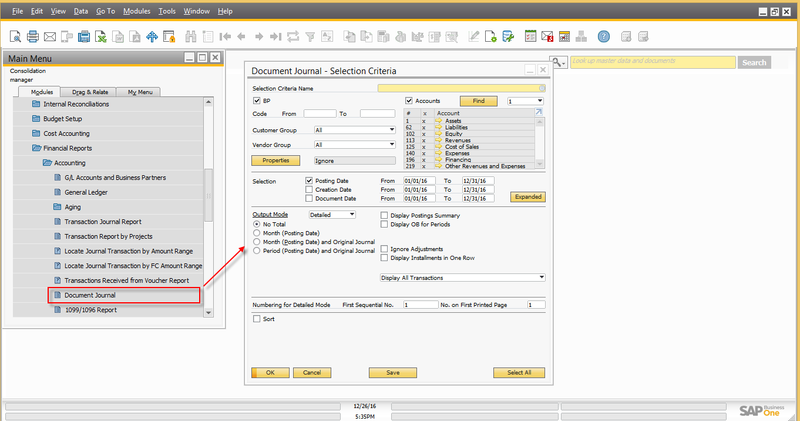 Document Journal reports appears based on selection criteria. This report provides the detail of intercompany sales transactions with information of transacting branch companies. 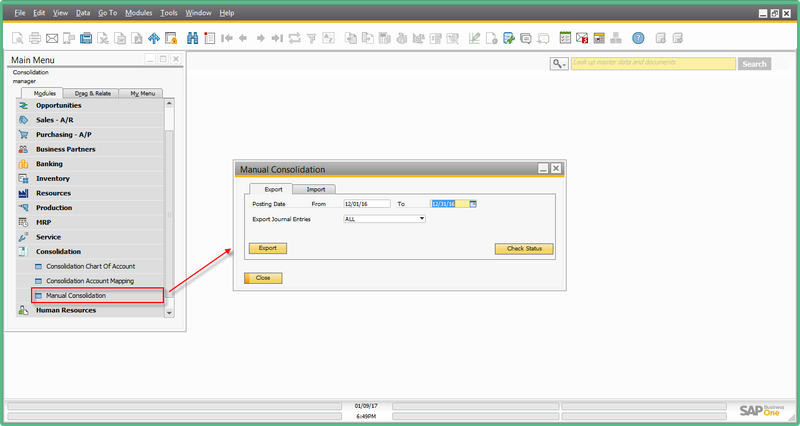 User can create the elimination journal entries with the help of intercompany sales data provided in this report. Please note this reporting will be available only on intercompany solution version 2.0 PL 00 and above, if any customer upgrades from the old intercompany version then this data will not be available for the transactions posted on old version. 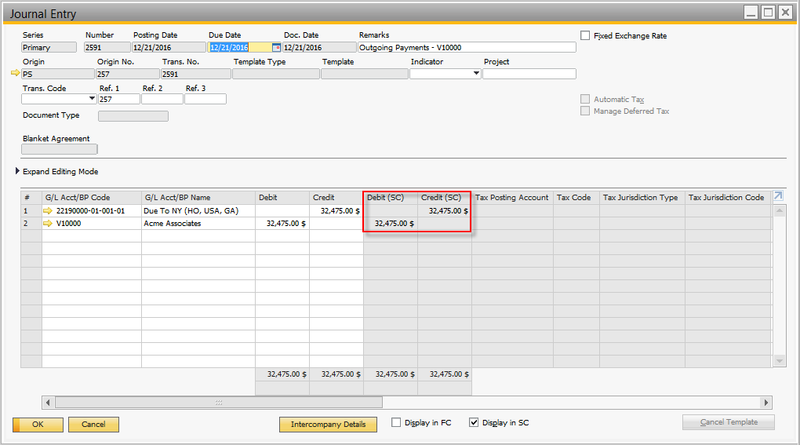 You can view the data of an individual company by filtering the SAP Business One financial reports in the Branch Code field of the consolidation company. 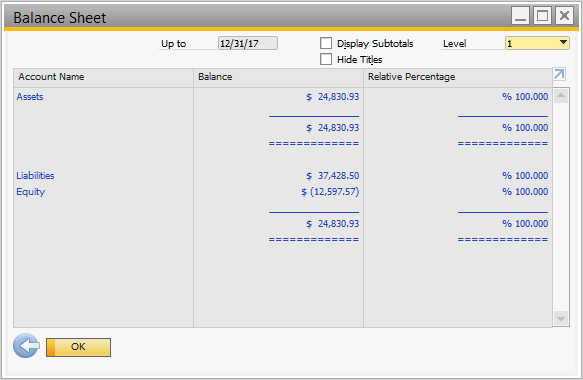 In the SAP Business One Main Menu, choose Financials –>Financial Reports –>Financial–>Trail Balance. In User-Defined Fields window, go to Branch Code (Row), choose Rule ‘Equal’ and select any branch code and Choose OK. Please note to view the report of entire group in case of multi-level financial consolidation, you can select the Branch Code of that group to view the report. The data appears will be filtered based on the selected branch code (group code). 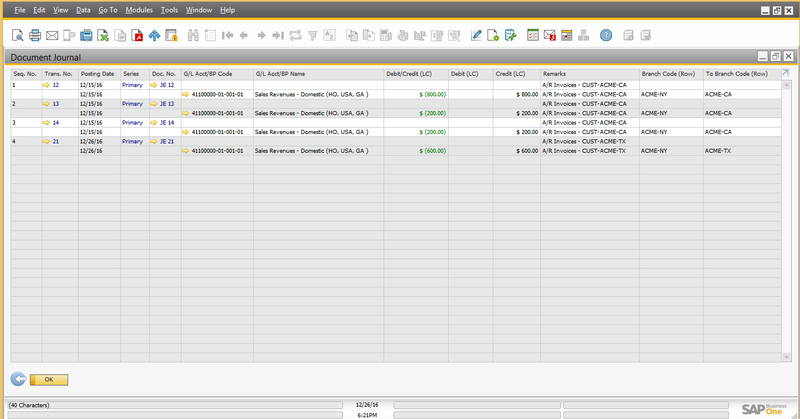 Similarly, you can filter other consolidated financial Reports.